The Velvet Underground, among the most influential bands of all time, are credited with creating a streetwise, pre-punk sensibility that has become inseparable from the popular image of downtown New York. "Discovered" by Andy Warhol in 1966, the VU - with their original line-up of Lou Reed, John Cale, Sterling Morrison, and Mo Tucker - would soon become the house band of the avantgarde, composing songs simultaneously furious in their abrasiveness and beautiful in their pathos, standing in striking contrast to the prevailing flower power of the era. All Yesterdays' Parties gathers for the first time almost all of the published writings contemporary with the band's existence-from sources as mainstream as the New York Times to vanished voices of the counterculture like Oz, Fusion , and Crawdaddy! The book is a revealing snapshot of an era by trailblazing rock writers such as Lester Bangs, Robert Greenfield, and Paul Williams. 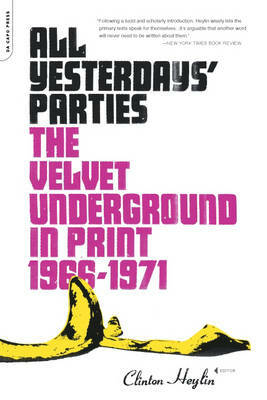 With photographs, posters, and other visual evocations of the period throughout, All Yesterdays' Parties is an invaluable resource, a trove of lore for anyone interested in the VU, their roots, and legacy.